Simple display that neatly shows off your T-Shirts! 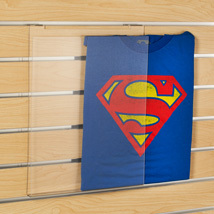 Attractively displays a folded t-shirt on slatwall. Includes acrylic insert for a neat look. 11 1/2 in. wide x 3/4 in. deep x 14 1/2 in. high.